In response to the many people who either do not have a Dutch oven or find it difficult to lift such a heavy pot, I decided to try making my no knead bread on a baking pan. Well guess what? It works. 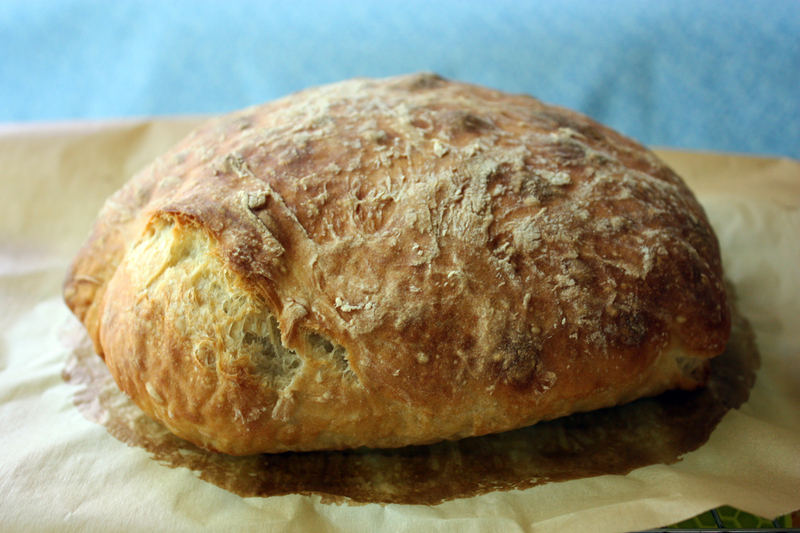 It makes a great loaf that’s soft inside with a beautiful golden crust. It’s not quite as crispy of a crust as the Dutch oven method but it’s close. It’s important to find a way to create steam in the oven because steam is what makes a crispy crust. But even without steam, it still bakes up nicely but with a softer crust. For my ciabatta bread, which needs steam, I used a disposable foil 6-cup muffin pan, which you can place beside or just below the bread. But I also found a small 9 by 5-inch baking pan for $3.50 and a restaurant supply store and it works well too. It’s what I used for this loaf. 25 Comments on "No Dutch Oven? This No Knead Bread is for You." Doesn’t hot water kill the yeast? All bread recipes call for warm water only. Can I use silpat sheet instead of parchment for this recipe? I tried this and it is very good. Great to have a recipe for those of us who dot=nt have a Dutch oven. it is not dry like some wheat bread, very moist! Jenny I discovered your bread recipe a few months ago and have had to make a couple of loaves each week. I taught my son in law by giving him all the ingredients and your recipe – plus he learned by watching your great instructional video! My bread just came out of the oven. I didn’t have a dutch oven so I used IMUSA non stick pan. And it baked perfect. We normally eat whole wheat bread so I added a little whole wheat (approximately 90g). Also, I used 1/2 tablespoon of zatar spice and 1 teaspoon of carom seeds for flavour. My husband could not believe that it was home made. Thank you so much Jenny for sharing yoir recipe. I have been making this when we go camping in my 12 inch deep Dutch oven (24 coals on top and 11 around the bottom give it 10 minutes to heat it to the 450) always a crowd pleasurer! I baked this bread for the first time this morning. I doubled the recipe (I have teenagers) and baked each loaf separately. My son cut the first loaf right out of the oven, so it was hard to judge the crumb. It tasted great, but again, too hot to tell anything. I’m waiting patiently for the second loaf to cool completely! I mixed everything last evening and left it out on the counter overnight in a very cool room (55 degrees). I’m thinking of keeping this in the fridge for a few days for it to develop a more sourdough flavor. I do spent grain baking, as well, I’m going to play around with this recipe and the spent grains and post a follow up. Made the bread, several times. Was told I need to make it a couple of hundred more to get it just right.”thanks”. On a serious note, it’s delicious and easy. Thank you. Love your bread. I’m baking it all the time for the family and friends. Just wandering, where do you place the oven rack when you bake the bread or rolls without the dutch oven(top or button part of the oven)? I’ve been working on a sour dough starter since first of January. Can this be put in fridge overnight , rather than the 3 hrs, and then proceed the next morning? Thanks! Do you have to put a lid on the baking pan where the bread goes? I bought the 3.5 dutch oven but with the lid it doesn’t fit In my toaster iven. You do need a lid to create steam inside the pot. You could try using the lid upside down. But first, remove the knob/handle but leave the screw in the hole to block heat from escaping. If you can’t leave the screw in the hole, you could fill the hold with aluminum foil. Let me know if that works. For health reasons I would need to use whole wheat or rye flour. I would also like to add some flaxseed or perhaps chia seeds. Would this still work? I also can not have oil of any kind so I use apple sauce. I’ve followed you for quite awhile but have had to change my diet. Please see my other variations. Can I make no knead bread in a 8 inch covered cast iron pot? Love your video’s. I bake sometimes the next day, in a cast iron pot with a lid, last 15 minutes without the lid. Please share some specific information about your exact ingredients, baking pan, source of steam, and oven. How long did you preheat the oven? With some more detail, we might be able to figure this out. Fantastic. Jenny, you are truly amazing. Thank you so much for your recipes.